The Connor figure recreates the strong, striking pose we see in Assassin's Creed III by the Colonial Assassin, creating a powerful replication, recognisable to all Assassin's Creed Fans. Equipped with his Tomahawk and Bow, Connor uses a mixture of stealth and combat to dispatch his enemies. By examining the figure up close we can see the detail that has gone into recreating Connor. Hand painted in his classic White and Blue Assassin Robes, Connor's Outfit remains true to those we see in AC3. The Hood has an Eagle pattern engraved into it, dipping into a sharp point. I was particularly impressed with the shape of the Hood, as it is accurately pointed. For Connor's Bow, Hachette have used string, something that works remarkably well, as it is tightened around the figure so that it does not dangle. My favourite part of the figure is the small Assassin insignia that can be found on the left vambrace, keeping his Hidden Blades (Pivot) secure on his wrist. ​The Connor figurine also includes the small beaded armbands, details that could easily have been forgotten in the creation process. This tiny detail shows how much time and effort goes into recreating the characters. Looking at the back of the figure we can see that Connor's holsters, buckles, belts and pouches are accurately painted in brown, as they are crafted from Animal Hide. Connor carries one pistol in his holster, adding to his arsenal of weapons. Although Connor is one of my least favourite Main Characters in Assassin's Creed, I was impressed with the recreation, and really liked the colours that had been used to hand paint the figure. 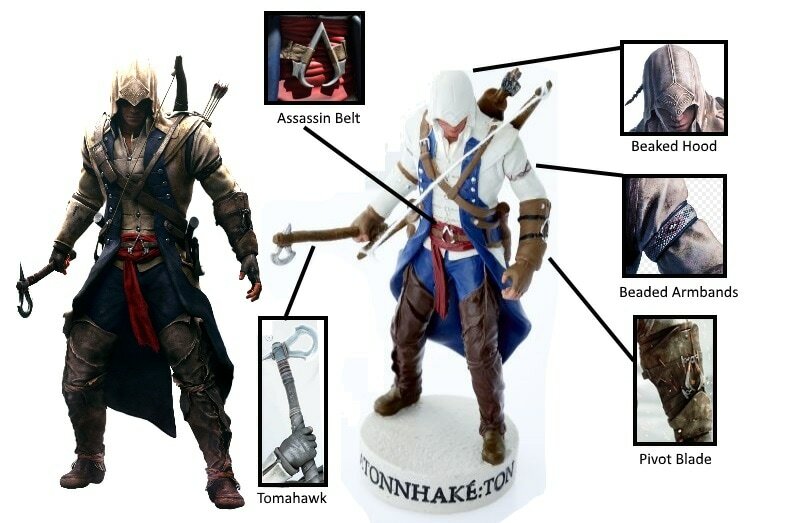 The mixture of Blue, Red, Brown and White paints make the Connor figurine stand out in the heart of any AC Collection. We start issue #6 with an overview of Ratonhnhaké:ton, a Master Assassin of the Colonial Brotherhood often known as Connor. He was active during the American Revolutionary War, and fought for freedom and justice from tyranny. He is recognised within the Brotherhood for his optimism, strength and courage. The Character Profile focusses on Connor's motivations, and the reasons for his fight for equality. "Devoted to justice, Ratonhnhaké:ton, fought with the continental forces to ensure that all men and women, regardless of race or class, could be equal and free". Although Connor is often seen as naive due to his strong sense of moral justice, he fights for what he believes in with such conviction that ultimately gains him respect, even from his enemies. Connor's story begins when his village is burned down by British Forces, killing his mother, and changing the course of his life forever. In 1769 he joins the Colonial Assassin Brotherhood, after a spirit journey initiated by a Piece of Eden, where he communicated with the First Civilisation Entity known as Juno. She tells Connor that the Templars are poised to locate the Grand Temple before the time is right, creating a chain of events that would bring the world to ruin. In order to protect the temple (as was the sworn duty of his people), he was to seek a symbol that would set him on the path towards his destiny. The symbol (Assassin Insignia) leads him to Achilles Davenport, Mentor of the Colonial Brotherhood. After much refusal, he eventually agrees to train Connor, after a group of mercanaries attack the homestead. Ratonhnhaké:ton's training begins, and is given the adopted name "Connor", after Connor Davenport (Achilles's late son). Friends and Enemies examines the many allies and foes, found within Assassin's Creed III. The conflict between Assassins and Templars means that Connor interacts with members from a variety of different factions. By backing the Colonial Forces, he aims to ultimately further his goal of freedom from Tyranny. On the Friends pages we find: Ziio, Kanentokon, Lafayette, Achilles, George Washington and Aveline De Grampre, who all support Connor on his journey. 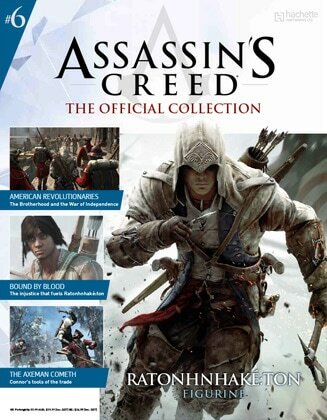 The Enemies section only shows Haytham and Charles Lee, but Connor would face many more. Both Grand Masters of the Colonial Rite (individually), they searched for the Grand Temple Precursor Vault that lay somewhere within North America. Both are killed by Connor due to their allegiance to the Templar Order, an outcome which he later regrets. Fights and Feuds looks at the different conflicts that Connor finds himself a part of when fighting to end Templar rule. Boston Tea Party is one in which he cuts the Templar's main source of funding by destroying the smuggled crates of Tea. This also proves to be damaging to the British Army, as the Sons of Liberty fight their own battle against British Control. The Alliance between Assassin and Templar is short lived, as Connor finds Haytham's methods to be too brutal and unnecessary. An example of this is when Haytham kills three informants, just to make sure that they were not lying. Connor would later kill his father, but come to regret and mourn the loss. It seems that an alliance between the two factions was always going to be short lived, as the phillosophies have different goals and beliefs. The Grand Temple Key can be found at the bottom of the Fights and Feuds page, an item that is the reason for the Templar's occupation in the Colonies. It is the source of the search for the Grand Temple, and is claimed by Connor after he kills all of the Templars. He buries it in Connor Davenport's grave, where it is found by his descendant Desmond Miles, who activated a precursor device known as "The Eye", which freed Juno and saved the world from destruction. Environments focusses on the any landscapes that can be found in Assassin's Creed III. One thing that I found interesting on these pages is in the bottom left hand corner, where we see concept art of Connor rowing a canoe, something that was removed from the game. In this section we find: American Frontier, Davenport Homestead, Mohawk Valley, Boston and New York, settings that are all visited by Connor in his pursuit of freedom. The last section is titled Weaponry and Equipment, and looks at the many tools used by Connor. War Club, Tomahawk, Bow and The Aquilla are all featured here, all of which are used to kill enemies of the Assassin Brotherhood. - Connor's Bow would later be used by the Assassin Callum Lynch. I found this issue to be very interesting, even though it missed many of the Key Templars that Connor would stand against. I also noticed that the issue did not mention any of Connor's Assassin Recruits, who also help to rid the Colonies of Templar Rule. This issue makes me question if a long standing alliance between Assassins and Templars can ever function in a beneficial way for both factions. Although Haytham and Connor did try, the future of the world may depend on such an alliance if Juno and the Instruments should rise. Hope you all enjoyed the issue, and my take on it.